"No I couldn't tell you!" It felt early, as if God was not yet awake. As if roosters had not yet crowed. 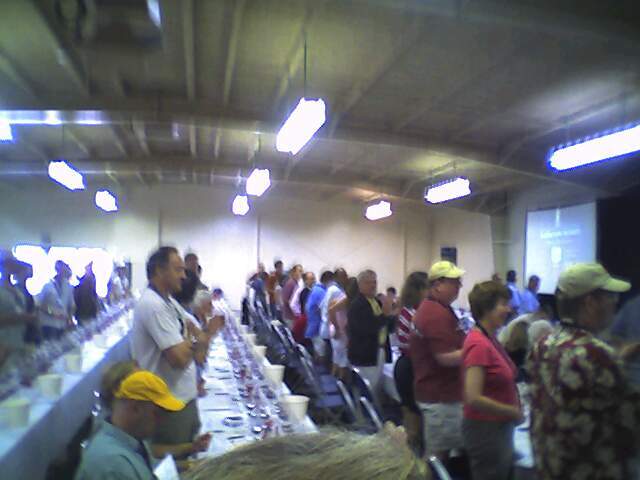 But perhaps that feeling was attributable to the many hangovers in evidence as we stood in line with other faithful attendees at the start of day #2 of the 2006 Hospice du Rhône (this year’s tagline "So many Rhônes, so little time!" The faithful had gathered to collect wisdom pearls from three well-renowned women winemakers – Christine Vernay, Françoise Peschon, and Vanessa Wong. And we had gathered to taste their wines. For the devoted, 9:00am is a good time to start tasting. Of course, one spits when tasting at such an hour! 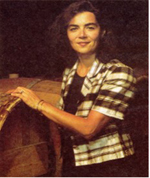 The morning began with Christine Vernay, daughter of Georges Vernay (history credits Georges with single-handedly reviving Viognier and the Condrieu region in the 1950’s after decades of decline). Christing never anticipated running the winery, which she assumed would go to her bothers. But they took up other vocations, and Christine hs ably taken the reins. Translating through her husband Paul, she presented her 2004 Viognier and a Syrah, the former being most notable. I was surprised to learn that even 25% of her “Condrieu Chaillées de l’Enfer” was aged in new oak, as it was so subtly integrated into this elegant wine that she must surely be using premium barrels made from well-aged oak – the effect was beautiful integration in this young wine, not the vanilla/coconut/tropical fruit notes that result from more rustic barrels. This was an absolutely lovely wine. Françoise has been with Araujo for years, and knows their history with the Syrah grape. The wine she poured for our 550 attendees constituted a significant percentage of Aroujo’s small Syrah production (just 250 cases in 2002 ). Equally memorable was the interesting terroir it expressed. Which requires me to take you on a quick detour about the vineyard. The 120 year-old Eisele (ICE-lee) Vineyard, best known for its Cabernet, is at the core of Araujo Estate. The vineyard, which was replanted in 1990, was taken organic in 1997 and biodynamic in 2000. On it one finds the Araujo Estate, a small chateau-style winery built to showcase the wine that could be produced from the Eisele vineyard, which rode to fame on a horse called Cabernet. Eisele Cabernet has been used in the award-winning wines of Ridge, Phelps, and the old Conn Creek, to name but a few. Peay Vineyards is on the northern reaches of the Sonoma Coast, on land that just a few short years ago, was thought to be incapable of supporting vines. It is clearly a cool climate, and in some years the Peay’s are indeed challenged to get their fruit fully ripe. But these difficult conditions also rewards the persistent (and the stubborn) with great fruit – in fact, Peay Vineyard was named one of the ten best vineyards by Food & Wine Magazine in December of last year. The cool climate allows them to leave the fruit hanging on the vines quite late into the season, developing the popular fruit complexity without lowering the acid and raising the sugars that occurs in warm-climate vineyards. I’ve concluded that America reached its dominant global position based on certain cultural traits that have served us well. But if one is exposed to those with different cultural perspectives, and if one is paying attention, it’s as if one is looking into a mirror that offers a very different reflection. As happened at this session, for example, when one of the European winemakers seemed offended by a rather simple question from the audience. It happened like this. The session involved three well-established Rhône winemakers (Laurent Combier of Dom. Combier, J.B. Erin of Dom Jean-Michel Gerin, and Peter Fischer of Ch. Revelette). Several years ago they decided they’d reached their winemaking pinnacle in France, and formed “The Trio Infernal” to seek a new challenge – producing Rhône varietals in Spain’s up-and-coming Priorat region. We first sampled their wines from France to establish a base flavor profile, then compared these to their wines from Spain. Of the three, Peter Fischer spoke the best English, and so took the lead at the microphone. Peter had discovered wine in his early adulthood while still living in Germany. He left Europe to earn his enology degree at U.C. Davis, then took his degree and winemaking skills to France in the 80’s to produce wine and buy his own vineyard. Peter was an outsider in the Rhône valley, both because he was German and because he ignored local wine-making tradition in favor of science. He described his first two vintages as “technically perfect wines that were totally ordinary, great dissapointments.” He had not gotten into the wine business in pursuit of “ Vin ordinaire”, and began investigating ways to craft more interesting, unique wines – like the intriguiing wines his neighbors produced, only uniquely his own. Over the 20 years Peter experimented with various techniques, concluding that the old-world approach to organic and sustainable farming produces the best possible expression of terroir – a wine reflecting the unique flavor of its place of origin. Now, this is a very typical question for American wine drinkers. Perhaps it is THE most typical question (since we’re used to seeing a varietal on our labels) but it is closely followed by such questions as ”what is the pH, teh date of harvest, the % alcohol, the time in barrel, the age of your vines, what % new wood?” ad nauseum. Listening to this, I was reminded of a lesson I learned during a recent conversation with Gary Burk of Costa del Oro (read more here.) It is a lesson I seem destined to continue learning, over and over – pehaps it is my koan. In synopsis, it is that winemaking is really about making the most enjoyable product possible, not getting all of the knobs on the "wine-o-meter" pointing to the proper reading, and doing so requires not just science, but soul. It’s just that I could enjoy a wine without thinking about it when I was in my early 20’s. And since then I’ve invested time and money learning how to deconstruct a wine and which of those components form the backbone of a wine I’ll enjoy. If it’s true that all one really needs to do is enjoy a wine and not analyze it, I’ve wasted an awful lot of time! It’s like running in a circle, arriving again at the starting point, and realizing the entire journey was for naught. But sometimes it’s good to come full circle – the starting point looks vastly different after the knowledge gained along the way. I prefer to think of it as the wisdom of maturity rather than the perpetual-motion meaninglessness of “Waiting for Godot”. Dave@SidewaysWineClub.com, who promises to spend two minutes simply enjoying wine for every minute he spends analyzing it. Posted byDave the Wine Merchant May 22, 2006 Posted inWineLeave a comment on "No I couldn't tell you!" Friday, 5/12 3:00 P.M. I thought about naming this posting "What? No Balloons?? ", as the afternoon tastings at Hospice du Rhone typically feature more balloons than your average political convention. Along with state-of-the-art media, they create a festive mood in synch with the overall HdR theme. This year we had high-tech wizardry in spades – lots of large, flat-panel screens projecting not only the featured auction items (many available for barrel tasting only at this afternoon’s event), but candid shots of the characters in attendance. But no balloons. I abandoned that idea after realizing the balloons were not missed, their absence overshadowed by the mass anticipation of tasting wines not normally available – whether previews of the wines for Saturday’s auction or Library wines long gone from retailer’s shelves. I debated with myself about how to highlight this tasting for you. At first I thought it would be difficult to share my experience without simply listing all the wines I tasted and the create tasting notes for those deemed worthy of putting finger to keyboard. Other sites do that quite well, and the market needs so many things before adding one more opinionated voice to the chorus. Further, I reasoned, why bother reviewing wines that we don’t carry, or that are difficult to find anywhere in the marketplace? I raised good points, but my internal editor countered with the indisputable question "What payoff would there be if the highlight of this post was a paragraph about the lack of balloons?!" So here for the curious are some of my favorites from the 40+ wines I tasted over the course of two hours. Renard, 1999 Syrah, Timbervine Vineyard. This is the sort of winery I like – small production, hand-crafted, and passionate enough to bet the mortgage that they can make a go of it in this crazy business. 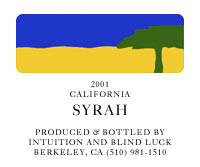 Producing just over 2,000 cases, including a number of Syrahs, their 1999 Timbervine Vineyard Syrah (originally $35) was one of my favorites of the day. In a sea of deep, dark and dense Syrahs all clambering to outshout the last, this elegant, spicy Syrah was notable by its softness. Of course, 6 years of bottle age makes the boldest of tannic monsters simmer down a peg or two, but I have a feeling this one was more on the elegant side when it first went into the bottle. Chateauneuf-du-Pape Vignerons & Rhone Vignobles – various producers. Tasting these wines relative to their domestic counterparts is the perfect showcase for anyone who still doubts whether different vineyards produce different flavors – not only was each wine distinct, one from the other, but their contrast with the domestic producers was even more dramatic – more earth, barnyard, and spice, less hot fruit. This entry is something of a tease, however, as I was unable to get through the crowds to taste a significant percentage of these wines and the event ran out long before my patience. 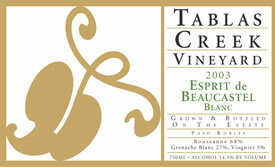 Tablas Creek 2002 Esprit de Beaucastel Blanc – Caveat. I’ve been a fan of this producer for a long time, and this was not a blind tasting. As such, it is impossible to taste these wines without bringing pre-conceived notions of their past flavor profile. There. That said, Tablas Creek wines, particularly their whites, express a most beautiful, complex mineral flavor that they attribute to their limestone vineyards (photo below is my best attempt to show a soil sample taken from their estate vineyard a year ago – click to enlarge). Best as food wines, or as wines to pour for those who really like to jump into the glass and figure out what’s going on. Our "Maya’s Selections" subscribers can look forward to Tablas Creek wines in an upcoming shipment. Anything from John Alban, if you can find it and afford it! Though difficult for most of us to conceive, it is theoretically possible for minute electrons to be stacked one on top of another, over and over, until they equal the height of the tallest mountain. If you can conceive of such a thing, you can envision the stack of electrons that make up my email inbox after being gone for four days at Hospice du Rhône. Despite my best intentions to post Blogs continuously throughout the event, I quickly learned that the speed of the event vastly outpaces the speed of my journalism. I apologize to subscribers who may have expected a full complement of Blogs in their Monday morning Feedblitz email feeds, which hardly had to break a sweat over the last few days. Which brings me to this posting about lunch on Friday – tradtionally, this lunch features international rosé wines made exclusively from Rhône varietals. It hardly seems woth mentioning here, given that these words are bound for the eyes of relatively sophisticated wine devotees, that these rosés are not your Father’s White Zinfandel. White Zinfandel has residual sugar that oozes over the side of a wine glass, whereas it’s difficult to find a Rhône-style rosé with more than a trace of R.S, and many are virtually dry. Still, I recall the cloying finish in my mouth after my wine tasting group (The Eno Files) chose rosés as our tasting theme. Even if completely dry, tasting one after another after another evenutally leaves one’s tongue lingering with flavors of strawberries, watermelon and even bubblegum making objective evaluation more difficult with each passing taste. Hospice du Rhone provides a great solution to this problem – don’t be so serious. Their rosé lunch offers no respite from a daunting variety of unabashedly pink wines. But serving them with food (great food, by the way – an impressive feat for Chef Laurent Grangien of Bistro Laurent) served alfresco on a hot day with some of the most enjoyable wine geeks (no, that is NOT a contradiction in terms! ), these rosé wines happily filled their role as not-so-serious quaffs that enhance the food, the mood, and the day. Not that we didn’t muster enough seriousness to take note of a few favorites. Look for these soon in our webstore as summer days demand them. A funny thing happens when you attempt to complement one of the organizers of Hospice du Rhone – he or she points to another organizer and say "S/he is the one you should really thank". I believe that, over the past three years of attendance, I’ve made a complete circle, being sent from one organizer to the next. A rare humility. And they certainly deserve our thanks for organizing sessions such the Friday morning "Priorat Posse"! Not just one but NINE producers of wines from Priorat presented their wines to the 550 attendees (a sold-out event again this year). For one of these garagiste producers, the samples poured for 550 made up 10% of their total production! Very generous. Lovers of wines made in the International Style and its "new wood order" didn’t like this session. These wines are high in acid, loaded with minerality, and surprisingly high in alcohol (though only one of them actually felt hot), and for the most part they feature oak in a supporting role. The one thing they had in common was a wine that did not have fruit gushing out of the glass, despite the use of the usually aroma-effusing Grenache (Garnaxta, in Catalan). One of the wine makers said it best when she recommended that we "Stick your ear into this glass and listen, really listen, for the wine has a tremendous story to tell". And that story is one of amazing vineyards. Priorat is located in Catalonia, the Northeastern-most area of Spain just below the French border, where the geological profile is dominated by Schist – small fragments of crushed Shale with a depth that can extend for many feet before more rich, water-retaining, organic material is found. This sort of growing condition tends to produce vegetation fiercely determined to live so that even plants that normally posses a sweet personality are forced to develop a real street-tough attitude in order to survive – think of a lavender plant turned "Little Shop of Horrors". The dominant grapes in this area are Carignan (Carinena or Carinyena in Catalan) and Grenache (Garnaxta), with some Syrah and Cabernet to round out the field. Those in the tasting will long remember the flavor profile of these wines – acidic, mineralic and tannic with very deep, dark fruit. A very interesting story to tell, indeed. My liver is being given a welcome break in the wireless internet lounge, enhanced by a bottle of sparkling water hijacked from the lunch table. Spitting hardly seems sufficient to brace one’s body for the onslaught of 15%+ wines that dominate today’s tasting stages. That said, today’s Hospice du Rhone is the 14th annual, which happens to be a magic number for any serious Cub’s fan. 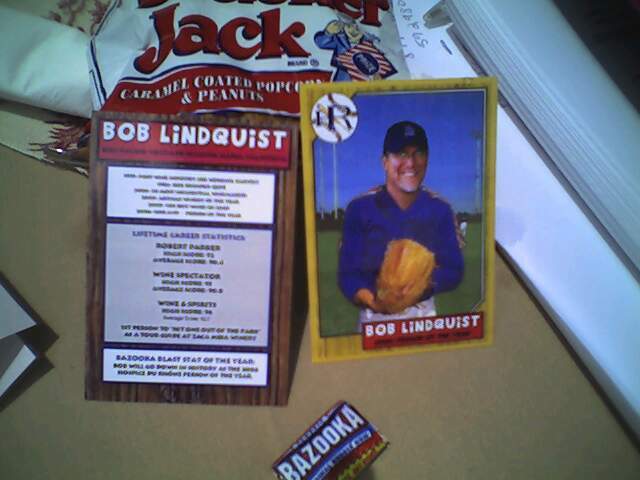 And my baseball analogy is apt for this year’s Person of the Year – Bob Lindquist of Qupe Vineyard – who was honored at today’s lunch with his image on baseball cards, apparently because he is a life-long fan of some team from LA called the dodgers. Some team who spoils their fans by actually winning pennants. Though I am not a fan of the pepper-and-jam, over-oaked, high alcohol, in-your-face Aussie Shiraz, the Elderton wines were far more interesting than I’d expected. For once, Aussie wines as enjoyable as their people! Save yourself some money and buy this $30 over their more pricey $80 "Command" vineyard Shiraz, as this delivers more fun for the money. Less oak than in previous releases (14 months instead of 24) and the wine is well served by this wise decision. Great education sessions by Rhône winemakers worthy of the term "legendary"
These guys are fun!! Never afraid to embarrass themselves for the good of the event, spoof videos, skits and auction leaders make this an event like no other. This morning’s two sessions feature wines of Australia and Priorat, for example, before breaking for a catered lunch with wines donated by all producers present – it’s sort of a grab bag of wines – the red wines are placed randomly on the tables (and yes, there’s a mad scramble as people grab food and rush to find the table with the best wines!) and the whites and roses are placed in random ice tubs. I can’t wait! After lunch (always attended by the winemakers too!) there is an hour break while the winemakers set up their barrel samples and we all get a chance to taste the wines of their next release. It’s tough work, tasting through all these wines to pick out the ones we like best, but it beats cubicle land! You can see our picks in upcoming club shipments, always featuring wines from small producers unlikely to appear in stores near you. We’ll bring you more info later today – sign up for our email notices of postings to read our upcoming posts. It seems everyone I know received a gift from their co-workers this week. Or from their kids – perhaps very appropriate given this Mother’s Day weekend. Sadly, this generosity is of the viral nature, and I don’t mean the sharing of amusing online ads. I mean the springtime cold – a miserable half-dead existence marked by an endless trail of tissues, loss of sleep, red noses, body aches and thinking at half speed. Modern medicine provides little relief and no cure. Over the years I’ve formed the opinion that the shortest path to recovery is a few good bowls of ‘Bubby-cillin" – home-made chicken soup. What does this have to do with wine? In my book, all paths lead to wine. You see, whenever I think of colds, I’m reminded of a Jewish friend I had in the sixth grade. He was the source of tremendous fascination to this goyum, and taught me some truly fun Yiddish phrases that sixth-grade boys found milk-through-the-nose amusing. I once asked my friend to bring the recipe from home so my mom could make it. As he did with all of my naive but sincere questions about his family, he patiently explained that his Bubby used no recipes for anything she cooked, "she just tastes her cooking after each step and knows what it needs next." As if I’d just been informed that Santa didn’t exist, this was an unbelievable revelation for a kid from a recipe-only household. It still is. Jump ahead to March, 2006, inside the brand new tasting room for Costa De Oro Vineyards in Santa Maria. In this attractive new building, surrounded by the Burk family’s strawberry fields outside and bushels of fresh produce inside, I was evaluating wines for our wine club panel. Gary Burk is the winemaker, and he hosted the tasting. I asked my usual battery of questions about the finished wine – it’s pH, TA, maceration time, etc. – and after a series of "I’m not sure" answers, Gary (one of the most polite individuals in the wine world) said "You know, there are some very good winemakers who make wine by the numbers, but I’m just not one of them. I remember tasting wines once with the late great Mike Bonaccorsi, when he discovered one he absolutley loved – he couldn’t rest until he’d gotten the lab reports, he even wrote them down in a book so he could run some trials with his own wine. I’m just not like that, I simply know the sort of wine I’m after, and don’t interfere much with the process." And there you have it – Pinot-cillin. This from a man who insists on harvesting his vines in eight separate passes, each taking only the most perfect of fruit. But then, that WOULD be the approach taken by an owner who came to the wine world via agriculture, and who konws the value of stewardship of the land. Costa De Oro – 2003 Pinot Noir, Gold Coast Vineyard, $27.25 – this unfiltered wine (always a plus in our book!) shows bright fruit flavors that are its most memorable feature. They bring to mind an adult version of the sour cherry candies of our youth. This wine is more complex and satisfying than our sugary memories but still features those same bright flavors. And since these flavors predominate, you’ll find none of the stewed fruit nuance found in some Pinot. 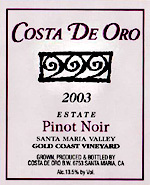 Costa De Oro – 2002 Pinot Noir, "Oro Rojo", $40 – First, a note about the label on this reserve wine. I believe the only reason there is any left is that the label, in all of it pinkritude, simply doesn’t say “this is a super-premium, award-winning, $40 pinot! !” Gary must have agreed, as he changed the label in 2003 (below), which is also a great discovery. In fact, we tasted the freshly-labeled 2003 next to this wine, and initial impressions favored the 2003. At first, it seemed friendlier, rounder, more come-hither. But as our tasting ended and dinner began – grilled turkey thighs, potatoes, and fresh green beans – the 2002 was gone first, a fool-proof consensus. There is something alluring about this wine, give it an hour in the glass and a great meal and watch the layers develop. I asked Gary about this feature and loved his response, “Yeah, this wine is like Isabella Rossellini at a party with beautiful people – at first you’re attracted to the flawlessly sculpted beauties, but as the night wears on you are increasingly drawn to her soft-spoken intelligence, alluring accent and comfortable sensuality.” Only 150 cases produced. Costa De Oro – 2003 Pinot Noir, "Oro Rojo", $40 – This wine shows a richer nose than the 2002 – look for slightly more toasty oak, black pepper, and bright cherry. On first taste, we preferred this wine to the 2002. Mouth-watering acidity, bright berry and cherry fruit, and subtle but pleasant oak spice. Also unfiltered, as is our preference. When pairing with food, lean towards the classic pinot foods – Game birds, roast chicken or turkey, Boeuf Bourguignon, Coq au vin, mushroom anything. Only 150 cases produced! I was listening to the news this morning about how the hispanic community is split over whether to support today’s work stoppage. Some favor it, others feel it will alienate their cause. Congress seems only slightly more unified in their approach to suggested solutions. I don’t propose solutions here, but rather pay a brief homage to the thousands of calloused hands that make possible the product of our passion. Without these seasonal workers, some legal, some not, the wine you enjoy would cost far more than it does today. "I like to think about the life of wine. I like to think about what was going on the year the grapes were growing… about all the people who tended and picked the grapes, and if it’s an old wine, about how many of them must be dead by now…"
So tonight, when we pop a cork over dinner with the Sagerman’s, I’ll think about the field hands that made it possible. I don’t know of any easy solutions on the immigration issue, let alone today’s work stoppage. This complex issue calls to mind a saying from an old favorite of mine, the crumudgeon, H.L. Menken (1880 – 1956), in what he referred to as Mencken’s Metalaw – "For every human problem, there is a neat, simple solution; and it is always wrong"
Tim McDonald – an A+ Spitter at the ’09 SFIWC! Now, in fairness, tasting six or eight 1-ounce wine samples doesn’t exactly strain one’s liver or raise one’s BAC to dangerous levels. And the lack of spitters at public tastings is not unusual. In fact, finding a high percentage of spitters at any wine gathering pretty much assures you it’s a trade tasting. Those in the trade not only spit, we take pride in it. Competitive pride. I’d like to tell you I’m the most accurate wine spitter you’ll ever meet. That’s what I’d like to tell you. The truth is that in the realm of professional spitters I come in at, oh, maybe a C.
My limited spitting skills became painfully clear some years ago during a barrel tasting at Napa’s Swanson Winery. Marco Capelli was their winemaker (now a consulting winemaker in Placerville) and our host for the tasting. He started the tasting by placing a 5-Gallon plastic bucket in the center of the floor before pulling a barrel sample with the wine thief. He dispensed a small taste into each of our glasses as he told us about the wine. One by one, each of us sniffed, sipped and then, taking turns at the spit bucket, bowed our head so that spitting was a combination of gravity and our natural-born ability to dribble. Then Marco stopped talking and took a small sip. He performed the requisite swirl and swish, considered it for an instant, and then stood where he was as he let fly a solid, cylindrical stream of wine. It was heard more than seen, hitting the bucket with such authority that not a single drop had enough nerve to defy the boundary of the bucket. He was standing comfortably upright, a full four feet from the bucket. Well, I’ve been following his advice for a dozen years now, and I’m still not a Grade-A spitter. But I can stand in the cellar with the best of them and issue forth a stream of sufficient force and accuracy so that I can avoid the heave-ho – one must exhibit sufficient spitting prowess to be worthy of tasting next to the winemaker. And of course, one must also be able to say something insightful and intelligent about the wine. But that’s a topic for another posting. In launching a business, one gives up certain things. A salary. Family time. Sleep. This latter sacrifice caught up with me recenty. I’d had one of those “up at 5:30, drive 350 miles, attend meetings” sort of days. And by late afternoon, perusing a wine publication at the local coffee shop seemed just the thing. But staying awake was a struggle. I read a frustrating article in silent disagreement with the curmudgeonly writer. He seemed threatened by our evolving industry – “Why buy Syrah when you can get Cabernet for the same price?” he queried, followed by inflexible statements such as “Napa is the only source for great Cabernet” and “Those who shun Chardonnay forget it’s simply the greatest white wine on earth!” His hubris grew irksome. I closed my eyes in frustration. They were closed just for a moment, and then… BANG! My head bounced on the table.